Spanish FM calls on Israel to support the troubled Mediterranean Union. 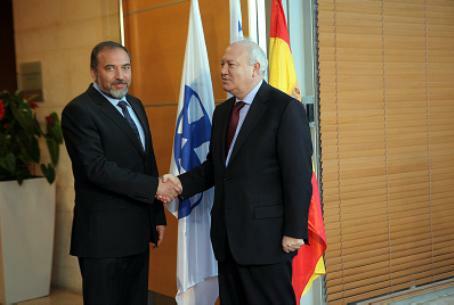 Foreign Minister Avigdor Lieberman met with Spanish Foreign Minister Miguel Angel Moratinos on Thursday during a visit to Madrid. Moratinos called on Israel to support the Mediterranean Union, and expressed support for United States efforts to promote talks between Israel and the Palestinian Authority. The Mediterranean Union, founded in 2008, aims to unite the European Union, northern Africa, Israel, and several Arab League nations to discuss matters of mutual interest. One of its aims is to promote Middle East peace, by bringing Israel and Arab countries together. Moratinos's request for support for the Union follows an incident earlier in the month in which the union was unable to adapt a regional water management strategy due to a disagreement between Israel and Arab states over a reference to Gaza, Judea and Samaria. Arab states wished to refer to the regions as “occupied territories,” while Israel did not agree to the term. Failure to pass the water management initiative was seen as a blow to the body, and an indication that it may not be effective. Previously, the Union experienced trouble during the early 2009 Cast Lead counterterror offensive in Gaza. At the time, analysts expressed concern that the conflict would render the Mediterranean Union no longer viable. The Union is hoping to recover from its past troubles during its first ever summit, to be held in June in Barcelona.